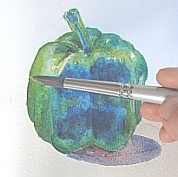 In this step by step watercolor demonstration, you will learn several essential watercolor painting techniques. I use these techniques to paint just about every subject. You will also get a glimpse at how I preserve light area without having to resort to masking fluid. 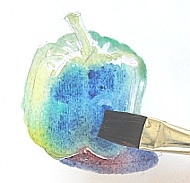 With my method, you won't have to deal with the hard edges left behind by masking fluid. 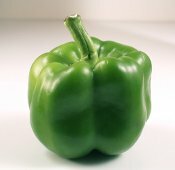 Here is a photograph of a green bell pepper that is lit from two directions. For my painting, I will recast it so that the light is coming from one side only. Thus, the shadow will be distinctly slanted to the opposite side. 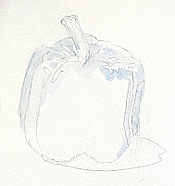 I start by creating a drawing of the pepper with a number 2HB pencil. No harsh or heavy lines here; the highlights and some bright lit areas are outlined, but not emphasized, as I like to leave some room for artistic expression. Photorealism is not my goal. I use a No.10 round brush loaded with clear water. Here I have tinted it with a little bit blue so you can see it more easily. I preserve the highlights this way instead of using masking fluid. 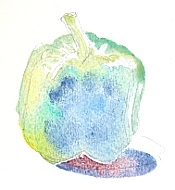 Continuing to mingle the colors, I blend ultramarine and cadmium red deep for the cast shadow underneath the bell pepper. Now while the body of the pepper is still somewhat damp, I take a flat brush either to add more ultramarine blue and phalo blue. I can tilt the brush to define the outlines of the darks. The timing is always tricky when it comes to adding more colors into an already-wet area. I adjust the tonal values of each mingle color, controlling the amount of water and pigments as I go, to cover all the areas. 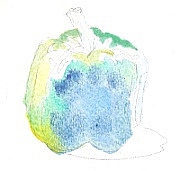 The middle tones are built up, and the stem of the pepper is also covered. I mingle some sap green and cadmium yellow medium on the light area. 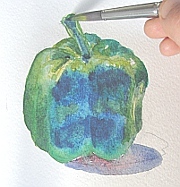 I also glaze the outer part of the light area of the pepper with more green to intensify the colors. Most of the areas are a little damp, so this is a good time to add more accent darks as well. Viola! And here is the finished piece. No need to keep going, or I might overwork it. 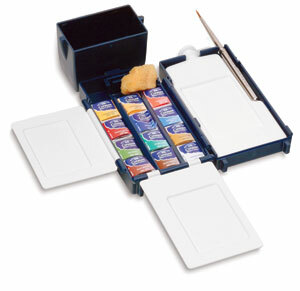 Depending on how hard or soft you want the edges and transitions to be, work on the darks while they are dry or damp. Add sharp accents when the area is almost dry. Practice the above steps often. 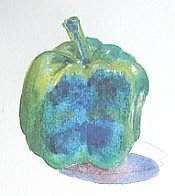 You will be amazed at how fast you will master the watercolor painting techniques presented here.